Who invented the post-it note? And why? Funnliy, for someone who uses so many post it notes, I have never asked myself this question. (I am a little embarrassed by this since ‘Why?’ is such a fundamental question in Agile Coaching!} Today, by accident, I discovered the answer. Ironically, a solution looking for a problem! Read more about the book and listen to the author on NPR radio here. For more on the history of the post-it note, visit the post-it website. No, that strapline is not missing an “e”. 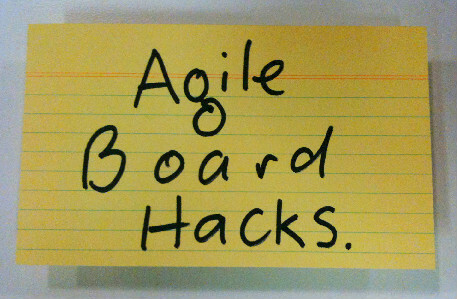 We Agilistas navigate through our days using tons of post-it notes. You can always tell where the agile folks have been: they leave a trail of the things just like Hansel & Gretel. When you’re facilitating, or even thinking, they’re just too handy. They allow us to group ideas, to reposition them in relation to each other. We can use their colour and arrangement to help us see patterns in ideas. We can have everyone in the room contribute their own ideas, and then group and edit them as a team. What could be better? Well…in some cases, this stuff. This turns any piece of paper into a post-it. You just smear a line of it onto a card or bit of paper and you can re-stick it and reposition it to your lil’ agile heart’s content. It’s called a re-stickable glue stick. So what? Well, it’s a lot neater and less splodgy than blu-tac, so it’s good for avatars and little badges which go onto the surface of index cards. Blu-tac often causes these smaller pieces of paper to warp. But it also lets you effectively create your own post-its. You can create post-its of different shapes, where the shapes are meaningful for your team. They could have templates on them for key terms, or story numbers, or, or… anything! You could get it here, for example.